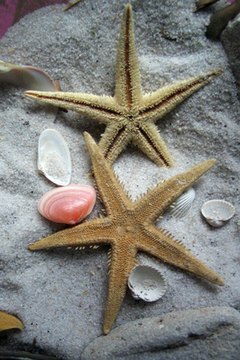 Starfish are not fish, but rather marine invertebrates or "echinoderms" in the class Asteroidea. Therefore, scientists prefer to call them sea stars. There are approximately 1,800 different species of Asteroidea. They are known for their ability to regenerate amputated limbs, and are characterized by flexible arms attached to a central disc. The central disc is essential to regeneration in nearly all sea star species. A sea star that has the ability to regenerate amputated limbs must first undergo a repair phase to heal the exposed wound. Once the wound is healed, the sea star can begin to generate new cells, which in turn, sparks new growth. Regeneration can take anywhere from several months to years. Cell proliferation that results in the growth of the new limb occurs in the final phase. If the final phase is interrupted, the resulting new limb may be deformed. Sea stars have the ability to reproduce sexually and asexually. Those that reproduce asexually do so by splitting its central disc into fragments, a process called “fission.” It can also reproduce asexually by amputating its own arms. Sea stars will also amputate their own limbs to escape from their predators. Each fragment of central disc or each detached limb can then undergo the regeneration process and result in fully grown sea stars that are genetically identical to the original. Most species of sea stars must split part of their central disc along with a limb for regeneration to occur. It is very unlikely that a severed limb will be able to regenerate into a full-grown starfish unless it is already attached to at least a portion of the central disc. Regeneration from a single severed limb with no central disc has been observed in some species of sea stars, including Linckia diplax; it's unlikely but not impossible. The severed arm is able to grow a new central disc and four additional arms, resulting in a full sea star.